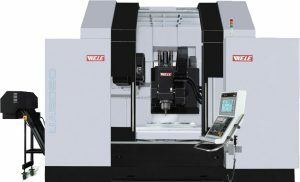 WELE’s pushes the boundary of innovation with it’s Five Axes Family, boasting features such as improved tool life and improved surface finish. 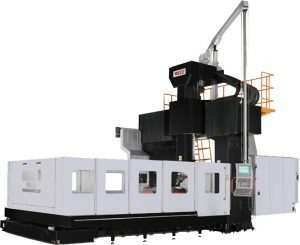 These machines are perfectly suited for cost effective rapid production of complex parts. Moving overhead gantry bridge machine with max up to 20m in X axis and 5m in Y axis is available. Twin driven feed system on X axis travel up to 6000mm with ball screw; rack and pinion driven feed system available with travel 6000mm above. Automatic multi-head exchange and storage system, AC tilting head with 5 axes simultaneous control are all optional available on the field. Max. table load of 2500kg/m² is provided. Special foundation at the customer site is required. Patented backlash eliminated mechanism is applied on the X axis travel. FANUC/HENDENHAIN controllers are available in tilting head made in Germany. (MG-U series). 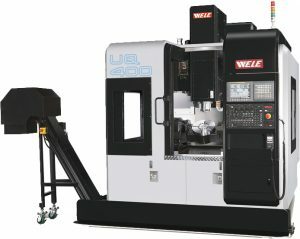 An additional tilting head available on all sizes of LB series machines called as UB series five axes simultaneous bridge machines. Own design or purchased tilting head are all available as required. Tilting angle range of ±110° on A axis and ±360° on C axis. 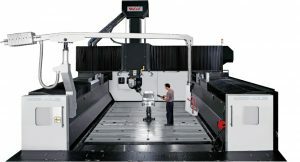 Z axis travel in 800mm as STD, 1000mm, 1200mm & 1400mm available as options. 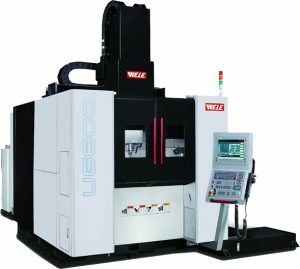 The UB machine is mainly for European and US markets. Equipping with FANUC/HEIDENHAIN controllers are available in tilting head made in Germany. Uses WELE own design trunnion table which have backlash free mechanism for high precision provided. Compact design for 5 sides & 5 axes simultaneous application jobs: Aerospace and general parts machining. Overhead moving gantry by twin driving system on Y axis. Own developed Trunion AC table provide max torque of 6000Nm on A, 2000Nm on C axis. Max. tool capacity of 60 is optional available. Heidenhain and FANUC controller both available on this field. Robust design for 5 axes simultaneous application jobs for aerospace parts machining. High rigid design of AB tilting head with max torques of 4950Nm/3650ft-lb on A axis and 7960Nm/5870ft-lb on B axis. Dual driven feed system on Y axis provides heavy movement performance.